Pools can be a hassle. We know – we’ve been there. There’s nothing worse than getting into a pool that is supposed to have been heated, only to find out the heater didn’t come on...Especially before a pool party! And you’re constantly having to check the heaters settings to ensure your kids haven’t turned it up or down too drastically. Then there are the surprise bills. You know the ones we mean - the energy bills that give you zero foresight into what your spending. All you can do is wait until you get the bill. And even if it isn’t as bad as you may have thought, it’s not knowing that is the problem! And when you try to conserve energy, by only heating your pool on weekends, you find out you’ve lost out on prime weekday swims, when the weather was just right. With the HeaterReader™, it doesn’t have to be like that anymore! 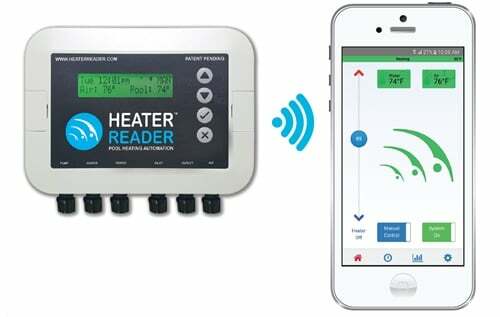 You see, the HeaterReader™ is a convenient wireless device that let’s you monitor and control your indoor or outdoor swimming pool’s heater and pump using our HeaterReader™ App. Want to go for a swim after work, but forgot to turn the heater on before you left? Manually set the temperature from any desktop or mobile device. Want the heat to be lower in the evenings to conserve energy (and cash)? Set a recurring timer. In fact, you can set up to 12 recurring schedules. Frustrated that your bill is going to be a surprise again? Use our Cost Analysis App to monitor your spending and adjust your usage/schedule accordingly! Always worrying that the heater has stopped working again? Not a problem! Check the App or depend on the HeaterReader’s instant notifications to tell you when your heater is running. It will even tell you if something has gone wrong. HeaterReader™ is available to purchase online. Click the button below to buy your HeaterReader™ today! Would you like to purchase a HeaterReader™ directly from a local Dealer? Click here and we'll put you in touch with a Dealer in your area. Interested in learning more about HeaterReader and it's multiple benefits?